[O]ver the past few months, it’s become clear that rich people are very, very afraid. Sometimes it feels like this was the main accomplishment of Occupy Wall Street: a whole lot of tightened sphincters. It’s not a stretch to say many residents of Park Avenue harbor vivid fears of a populist revolt like the one seen in The Dark Knight Rises, in which they cower miserably under their sideboards while ragged hordes plunder the silver. “This is my fear, and it’s a real, legitimate fear,” Greene says, revving up the engine. “You have this huge, huge class of people who are impoverished. If we keep doing what we’re doing, we will build a class of poor people that will take over this country, and the country will not look like what it does today. It will be a different economy, rights, all that stuff will be different. “There are all these people in this country who are just not participating in the American Dream at all,” he says. This makes him uncomfortable, not least because they might try to take a piece of his. “Right now, for some bizarre reason, a lot of these people are supporting Republicans who want to cut taxes on the wealthy,” he says. “At some point, if we keep doing this, their numbers are going to keep swelling, it won’t be an Obama or a Romney. It will be a ­Hollande. A Chávez. I don't think we're that close to 1848, but typically, when inequality gets too broad, civil unrest follows. This isn't new. And while I would prefer Greene and others like him to support paying their share out of moral obligation and a belief that shared sacrifice yields shared riches—that it makes the pie higher, to quote a former president—I'll take consequence-based ethics if it gets the same result. Never before, over the term of Chicago's 142 year observational record, have so many 90s accumulated at such an early date. July alone produced 18 days at or above 90---far beyond the seven considered normal, yet just shy of the 19 days of 90s recorded in 1955 and 1987—both record highs for the month. History tells us we've likely NOT seen the last of the hot air. An estimated 35 percent (more than a third) of Chicago's remaining 90+degree temperatures have typically occurred from this date forward. At least today and tomorrow should be cooler, 27°C today and 28°C tomorrow, before going back into the red zone on Thursday. Good grammar makes good business sense — and not just when it comes to hiring writers. Writing isn't in the official job description of most people in our office. Still, we give our grammar test to everybody, including our salespeople, our operations staff, and our programmers. In the same vein, programmers who pay attention to how they construct written language also tend to pay a lot more attention to how they code. You see, at its core, code is prose. Great programmers are more than just code monkeys; according to Stanford programming legend Donald Knuth they are "essayists who work with traditional aesthetic and literary forms." The point: programming should be easily understood by real human beings — not just computers. Yes. Clear writing shows clear thought, almost always. I might not go so far as to use a grammar test for new employees, but I do pay attention to their emails and CVs. Despite having two Atlantic named storms before June 1st, so far the tropical storm season has been eerily quiet with 4 named storms. Then I did a little poking around on the Intertubes and realized that no, we usually don't have that many by the end of July. With all the energy in the Northern Hemisphere atmosphere this summer, September might be more interesting than usual. But so far in July, we seem to be about average. In every developer's life, there comes a time when he has to take all the software he's written on his laptop and put it into a testing environment. Microsoft Azure Tools make this really, really easy—every time after the first. Today I did one of those first-time deployments, sending a client's Version 2 up into the cloud for the first time. And I discovered, as predicted, a flurry of minor differences between my development environment (on my own computer) and the testing environment (in an Azure web site). I found five bugs, all of them minor, and almost all of them requiring me to wipe out the test database and start over. It's kind of like when you go to your strict Aunt Bertha's house—you know, the super-religious aunt who has no sense of humor and who smacks your hands with a ruler every time you say something harsher than "oops." End of complaint. Back to the Story of D'Oh. I hope to finish moving my websites into the cloud by the end of the year, including a ground-up rewrite of Weather Now. Meanwhile, I've decided to try moving that site and three others to an Azure Virtual Machine rather than trying to fit them into Azure Cloud Services. For those of you just tuning in, Azure Cloud Services lets you run applications in roles that scale easily if the application grows. A virtual machine is like a standalone server, but it's actually running inside some other server. A really powerful computer can host a dozen small virtual machines, allocating space and computing power between them as necessary. You can also take a virtual machine offline, fold it up, and put it in your pocket—literally, as there are thumb drives easily as big as small VMs. This is called infrastructure as a service (IaaS); putting applications into cloud services without bothering to set up a VM is called platform as a service (PaaS). IaaS offers few advantages over PaaS. The principal disadvantage is that VMs behave like any other computers, so you have to care for them almost as if they were pieces of hardware on your own server rack. You just don't have to worry about licensing Windows or hoping the electricity stays on. Also, VMs are expensive. Instead of paying around $15 per month for a web role, I'll wind up paying about $80 per month for the VM and its associated storage, data transfers, and backup space. And this is for a small instance, with a 1.6 GHz processor and 2 GB of RAM. VMs go up to 8-core, 16 GB behemoths that cost over $500 per month. On the other hand, my server rack costs easily $100 per month to operate, not counting licenses, certificates, me tearing my hair out when the power fails or my DSL goes down, and having to keep my living room the Inner Drive Technology Worldwide Data Center below 27°C year-round. The Daily Parker, this blog, which runs on the open-source dasBlog platform. I estimate that porting this blog to PaaS will take about 12 hours of work, and I have lots of other (paid) work ahead of it. In principal, I need to change its storage model to use Azure blobs instead of the local file system, which doesn't work the same way in Azure Web roles as it does on an VM. Weather Now, which is overdue for a ground-up rewrite, and uses a lot of space. Porting the application will take about 12 hours, plus another 12 hours to port the GetWeather application (which keeps the site supplied with weather data) to an Azure worker process. That's time I can better spend rewriting it. Moving it to a VM shouldn't take more than an hour or two. My SourceGear Vault source code control system. Since I don't own the source code, I simply can't port it. Plus, it uses a couple of worker processes on the server, which I also won't be able to port. My FogBugz issue tracking system. Same problem: it's not my software, and it uses a couple of worker processes. I can either install it on a server from a commercial installation package, or I can sign up for FogBugz on demand for $25 per month. And also lose my Vault integration, which lets me track all of my issues back to actual pieces of code. So watch this blog. In a couple of days, it's liable to migrate to an Azure VM. Long-time readers will know how I feel about Microsoft certification exams. When it came time for 10th Magnitude to renew its Microsoft Partner designation, and that meant all of us had to take these tests again, I was not happy. So, against my will, I took exam 70-583 ("Designing and Developing Windows Azure Applications") and passed it. I am once again a Microsoft Certified Professional. The brokerage said Groupon Goods, the company's consumer products category, is increasingly becoming the merchant of record - the owner of goods being sold or the first-party seller. As first-party sales assume inventory risk and drive higher revenue contribution, the composition of Groupon's first-quarter revenue beat in North America has become questionable, analyst Ken Sena wrote in a note. "Growth in unique visitors in the U.S. to Groupon.com, which can be looked at as a proxy for subscriber growth, exhibited negative year-over-year trends this quarter," Sena said. Essentially, no one is buying stuff from Groupon, which leaves them holding the bag on lots of it. A slew of analysts cut their ratings and price targets for Zynga after it reported lower-than-expected quarterly results on Wednesday and forecast a much smaller 2012 profit. Zynga has been hit by user fatigue for some of its long-running games and a shift in the way Facebook Inc's social platform promotes games. "The biggest factor impacting current performance appears to be the way Facebook is surfacing gaming content on its platform," JP Morgan's Doug Anmuth wrote in a note to clients. 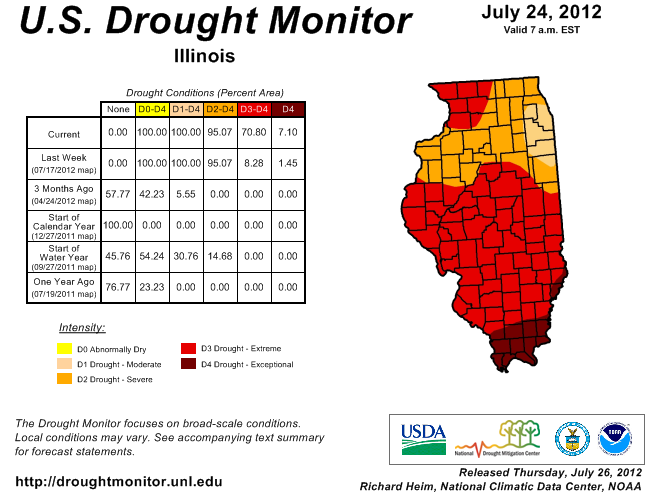 The latest U.S. Drought Monitor has expanded D3 “extreme” drought across Illinois. It went from 8 percent of the state last week to 71 percent this week. This major shift was based on a number of short-term drought indicators based on rainfall, streamflow, and temperature, as well as from widespread reports of significant crop and pasture losses. Earlier this week, the USDA NASS reported that 66 percent of the corn crop, 49 percent of the soybean crop, and 91 percent of pasture was rated poor to very poor. Topsoil was rated at 91 percent poor to very poor and subsoil was rated 97 percent poor to very poor. The hottest July ever in Chicago averaged 27.4°C; so far this month has averaged 27.8°C, though today and Saturday are forecast to be about normal. Food prices, electricity expenses, health-care costs: all are higher this month than one would expect for July. Welcome to the 21st Century, where the weather is as if everyone has moved 800 km south. Chicago today looks set to get up to 39°C, part of an emerging pattern of worsening heat waves in the region. 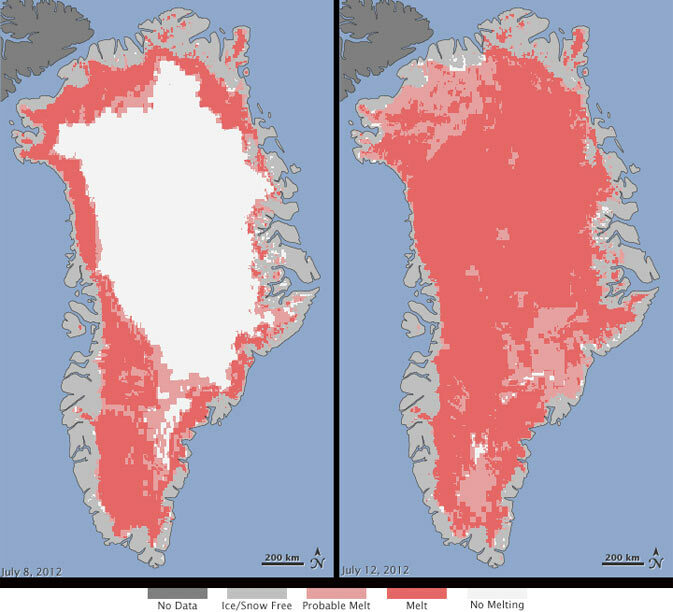 About half of Greenland's surface ice sheet melts during a typical summer, but [Jay Zwally, a glaciologist at NASA's Goddard Space Flight Center] said he and other scientists had been recording an acceleration of that melting process over the last few decades. This year his team had to rebuild their camp, at Swiss Station, when the snow and ice supports melted. He said he was most surprised to see indications in the images of melting even around the area of Summit Station, which is about two miles above sea level. Greenland's ice sheet accounts for possibly 25% of the world's fresh water. A massive release of that water into the North Atlantic would not only raise sea levels worldwide, but also could distrupt thermohaline circulation, which in turn would make northern Europe's weather more like Canada's. Of course, we'll all forget this in the winter, and react with surprise and alarm in a year or two when we have another record-breaking summer. Time to adapt.